Submitted by Denise Azucena on Jun. 20, 2018. Originally published on May 4, 2017 and last updated on Jun 20, 2018. This guide is for anyone looking for a new compressor for their 500 Series rack. For this June 2018 update we expanded our short-list and examined reviews and forum comments from around the web to produce a new set of ratings for all eligible 500 series compressors. The major change was that we removed the elysia xpressor due to a drop in its ratings. The ratings for our other recommendations remained the same except for the stereo TK Audio BC501 which went up slightly. The 560A is one of the most used 500 series dynamic modules for compression in the industry. It offers a classic hard knee compression and OverEasy mode - that's dbs's soft knee mode. It incorporates dBx's program-dependent attack and release times. It is a natural sounding dynamic processor with a wide-ranging threshold, ratio and output controls and true RMS level detection. Its "Infinity +" inverse-compression feature decreases the audio output level when the input exceeds the threshold beyond unity gain, which is useful in live settings when you need to control mix levels of extremely loud signals. Many customers gave positive feedback after they used this compressor. Some of them mentioned it provided aggressive and punchy drum recordings. They have also achieved good results while mixing other instruments too. It has been mentioned in forums how natural sounding the compressor is, and that it has clean input levels and gain reduction without extra noise. In regards to construction, it has a sturdy build and easy to use controls. Many sound engineers and experts have tested and approved this compressor for professional use. Geoff Stanfield from Tapeop.com tried tracking acoustic and electric guitars and mentioned: "it gave a slight midrange bump that translated as fatness and glow". Barry Rudolph, a contributing editor for Mix Magazine, said in his Music Connection review that it "worked well for keeping things steady, such as individual electric guitar tracks, stereo Fender Rhodes pianos, or for bass guitars using low 2:1 or 1.5:1 compression ratios." There were no consistently reported negatives about this compressor. At an affordable price, the 560A gives you broad range compression options to use for recording different instruments. 93 out of 100. Incorporating 10+ ratings and reviews. The RNC500 is the 500 series version of FMR Audio's well-renowned RNC rackmount compressor. It is a simple and affordable compressor that delivers an improved dynamic fidelity over the original RNC. It features over-current protection, which protects the whole 500 series rack from external damage, and an early warning power-supply detection that puts the module in bypass mode while switched on to avoid powered down “pops”. Its highlight features include its Normal and SuperNice mode, which gives you flexible compression options. The Normal mode acts as a regular hard-knee compressor, while the SuperNice mode provides a 3-band transparent sounding compression. Dimensions (H x W x D): 10.9" x 6.5" x 2.3"
The reviews and forum comments for this compressor continue to be quite positive. Some users praise it for its transparent sound and how affordable it is. Some of them also talked about its great metering capabilities. In his Sound on Sound review, Bob Thomas discussed its performance for its price. He mentioned how he was able to pull together different instruments in a transparent manner and be able to achieve a more natural sound type of compression with the use of its SuperNice mode. This is a great choice if you are looking for a simple and straightforward module at an affordable price. The BC501 is one of TK Audio's best-selling 500-series modules. It has a combination of features that are based on the BC1-S rackmount compressor and the BC2-ME mastering compressor from the same manufacturer. The additional features taken from the BC2-ME include ratio settings (1.25:1, 6:1), a THD switch that adds even harmonics to the signal, and three High Pass Filter settings on the sidechain (80Hz, 150Hz, 220Hz). It makes it easy to apply parallel compression with its built-in dry/comp knob. All of its controls are stepped for precise and easy recall. It also has an external sidechain input provided via 3.5mm TRS to connect external hardware. Experts, sound engineers, and home studio owners agreed this works best for mix-bus compression. They mentioned that this blends the mix like ‘glue’ while using it with low ratios and small amounts of gain reduction. In Hugh Robjohn's Sound on Sound review, it was mentioned that the compressor is generally transparent yet "the inclusion of the THD switch introduces a subtle richness, adding some interesting character, particularly on transient-rich sources." Scott Evans, a writer for Tapeop.com, gave great comments for the BC501's design mentioning its "controls feel great, and the front panel is well- designed and easy to read." 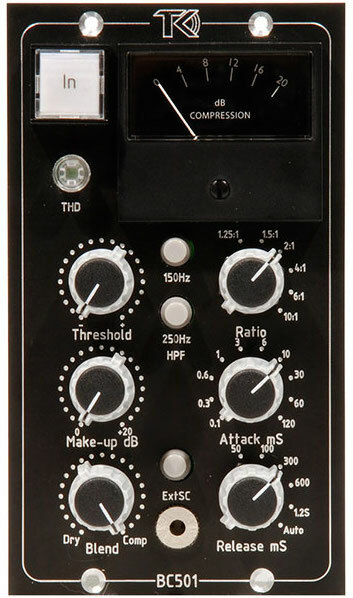 Fellow sound engineer Don Gunn mentioned he favors the compressor's variable high pass filter feature on the sidechain detector in the same review. He stated this feature "lets you set up an HPF to prevent low-frequency signals from causing the compressor circuit to over-react." There were no consistently reported negatives, in fact Hugh Robjohn said, "I really can’t find anything to fault". This versatile stereo compressor is a good choice to use for mix bus compression to 'glue' or make your mix sound cohesive. The API 527 is a VCA-based compressor/limiter that is modeled on API's 225L single channel compressor. This single channel module features a flexible "feed forward" (NEW) and "feed back" (OLD) gain reduction methods that provide you a choice of using the "old way" or "new way" of compression. The "old way" shows how classic compressors are using the gain control circuit while the "new way" provides a newer VCA type compressor that relies on RMS detectors for the gain control voltage. This module offers options for achieving uncompressed sounds or hard knee for limiting by using the "SOFT"/"HARD" switch for an "over-easy" type compression. Its attack, threshold and decay settings provide a wide range of control over compression. Using its patented Thrust switch allows frequency dependent side chain control. This compressor particularly uses both 2510 and 2520 discrete Op-amps that gives it API's signature sound. A lot of reviewers praise this compressor for its versatility. Both users and experts have used it successfully while recording a range of different instruments. It works just as well as a vocal compressor. A lot of users have found its New (feed-forward) and Old (feed-back) setting useful for tracking. As mentioned in a review from the ProSound Network Editorial Staff, they tested this compressor and preferred using "the OLD setting on acoustic guitars, strings and less aggressive vocals," which uses the VCA’s output to feed the side chain to work like most classic circuits. A few experts used its patented Thrust feature to their advantage when controlling pumped up dynamics. In Hugh Robjohn's Sound on Sound review, he wrote that even on extreme settings, the sound character of this compressor remains clear and crisp. A few users have mentioned it doesn't really act as a limiter since it doesn't do heavy limiting. The 527 is a great choice to use as a compressor rather than a limiter. It's also a great choice if you are looking for a simple yet versatile compressor for tracking vocals and instruments. 93 out of 100. Incorporating 5+ ratings and reviews. Crane Song's Falcon 500 Series module is a classic vintage sounding tube compressor with modern versatility. It features hard and soft knee choices for compression and limiting, as well as 3 attack and release time settings. It has a color switch which changes its audio path to have negative feedback for a more colored vintage compression. This compressor's color switch also provides an option to not have negative feedback for a cleaner sound. Its wet/dry mix knob makes parallel compression easy to use and is linkable with other Falcon modules for a full surround sound compression purpose. Reviewers mention how transparent the sound is and how easy and straightforward it is to use. Both expert and user reviews liked using this while mixing vocals. Barry Rudolph mentioned in his Mix Magazine review that he uses the Syren's Open mode for vocals "for a fat, rich sound and good low frequencies." In his Sound on Sound review, Bob Thomas very much liked how its special setting emulates an optical compressor and how its Wet/Dry output mix control gives the user "access to parallel compression without tying up another mixer channel." It sells at the higher end of the price range for a single channel 500 series module but that is justified by its quality and performance. It's a great choice if you would want a vintage-style optical compressor/limiter to add to your 500-series collection. Voltage Controlled Amplifier compressors allow control of faster attack and release parameters. A lot of plug-in compressors are based on the VCA type since it's the most used type of compressor. Their response curve is mostly linear (hard knee), but some have built-in soft knee to adapt them to mixbus compression purposes. They use IC chip-based transistors that determines input voltage to control gain reduction results, which gives the compressor a clean and controllable characteristic that people look for. Optical or Opto compressors use a light source to determine gain reduction. How bright the built-in light source is determines the intensity of the incoming signal voltage. These compressors use photocells as a detector to determine the amount of compression that is applied. They are less sensitive to transients, peaks and sudden spikes meaning much higher ratios can be used. They tend to have natural smoothness in response time due to the inherent delay of triggering the attack and release of the compressor. Variable-MUs are tube-based compressors known for their tone and warmth. Their design uses input voltage changes to alter the bias of the tubes that controls the gain-reduction stage. They tend to have a “soft-knee” and "slow-attack" style that produces a more smooth compression. Their ratios are program-dependent and increase with the gain reduction. This means the louder a transient is, the harder the compression. They have a slower and less impulsive response time compared to FET and VCA compressors. Field Effect Transistor compressors provide highly colored versions of compression and fundamentally are a subset of VCA compressors. Compared to Variable-MU and optical options, they have more control on grabbing harsh transients. They are often used as a solid-state emulation of tubes and have a much faster response when it comes to compression. Their trademark sound produces a punchy and far from transparent characteristic. Hard knee compression is when the compressor immediately reduces the signal once the it hits the threshold. This type of compression is commonly used if you want to reduce transients right away and is suitable to use on instruments such as snare drums. On the other hand, soft knee compression occurs when the signal is gradually reduced after the signal exceeds the threshold. This is for a more natural-sounding compression and recommended to use on sustaining instruments such as strings. Choosing a compressor is based on how to maximize its uses, and what type of sound you would want to achieve. VCA compressors usually control transients and give transparency and aggression in the mix. VCA compression is useful for recording percussion to provide a precise and punchy sound. Mixing, mastering, and tracking are factors taken into account when choosing which type of compressor is best suitable for each process. For example, FET compressors are not recommended to use for mixing and mastering since they give colorful sound characteristics. Since they are known for aggressive and quick attacks, they are more suitable for tracking and parallel compression. On the other hand, optical compressors are preferably used to compress any sound source naturally such as vocals, strings, and bass. Tube-based and stereo compressors often are used for mastering purposes to make the mix sound smoother and homogeneous. For our June 2018 update we looked at all the 500 Series Compressors available from major American online retailers and short-listed 20 of the most popular for detailed analysis. We then examined reviews from users and experts as well as forum discussions to get the data for the Gearank Algorithm to produce the scores out of 100 you see above, and to present our reports on what people liked and didn't like about each option we've recommended. For more information about this process see How Gearank Works.